Service Costs > How Much Does It Cost to Dry Clean a Suit? The difference between dry cleaning and the conventional washing lies in the cleaning solvent used. Dry cleaning uses a non-water based cleaning solvent, hence, the term “dry cleaning.” It is used on fabrics that are too delicate to be put into a washing machine such as a suit. Since most suits are made from delicate materials, it should not be thrown in a regular washer. In fact, most manufacturers, if you read the tag, will recommend you always take your suit to a dry cleaner for the best results. On average, dry cleaning a suit can cost around $10 to $35. This price will depend on the type of suit, the dry cleaner you use and where you live. Refer to the chart below for the costs you will probably pay. The SpitSpot.com, a dry cleaner in Maryland, for example, charges $9.50 for a two-piece suit and $12.50 for a three-piece suit. In this Angie’s List article, they had interviewed a few dry cleaners across the United States, and from their research, they had found the prices could range anywhere from $13.50 to dry clean a two-piece suit in Massachusetts to as little as $9 for the same items at another cleaner in Texas. Dry cleaning service done on the same day as the items are dropped off will have to pay a surcharge of 50 to 75 percent of the total cost. Some dry cleaners, depending on the policy, may add a few extra dollars to the bill if your suit if made from wool or silk. Most services offer pickup and delivery for a small fee, depending on the distance traveled. Most of the time, this will be a flat rate somewhere around $15 to $20. 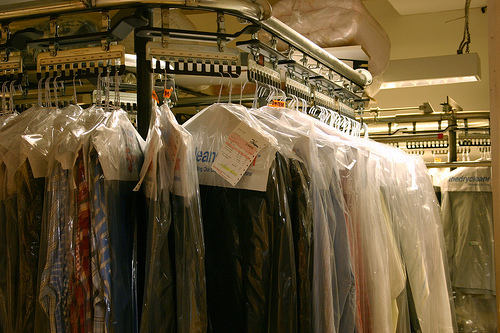 Once the dry cleaning is finished, your garments will be hung on a hanger and covered with a plastic overhang. This will protect the garment while it is being transported to and from the dry cleaning service. Depending on the service provided, it can either be picked up at the dry cleaning location or delivered to you for a small fee. As long as the service isn’t too busy, your suit will take two to three days to complete. Do not remove stains from silk garments by using water, soap, or by rubbing because the material can be easily damaged. Do not keep soiled garments for long because the stains can oxidize and may become non-removable when it ages. Store your silk garments in a cool and dry place to prevent them from getting brittle and faded due to sunlight exposure. Frequent dry cleaning may damage or decrease a garment’s lifespan because the high drying temperatures, chemicals, and solvents used in the process will weaken the threads and fabric of your suit over time. With that being said, dry clean your suit as little as possible. As an alternative to dry cleaning, you may remove any stain on your suit by washing it with a mild soap and warm water. To do away with any crumples or stretches, consider using a clothes steamer instead. As a general rule of thumb, try to dry clean your suit as little as possible. If you wear your suit a few times per year, then one year should suffice; however, if you live in your suit, then you should consider dry cleaning it every other week. Stephanie at Six Figures Under shares five ways to save on dry cleaning. She recommends either looking for items that say “dry clean only” or consider don’t dry clean it, even if the tag says you have to. If you are a regular customer with some cleaners, you may be entitled to some discounts. Ask or even check their official website to see if any are available. Since this is a competitive industry, consider looking for coupons online or even consider Groupon. Before choosing a dry cleaner, however, be sure they have reputable reviews online. In between dry cleaning sessions, allow your suit to hang for a few days before wearing it to allow your material to recover and drape out any wrinkles. Also, consider covering it up with a cloth cover to allow the air to circulate while being stored but protect it from the outside elements.